People now generate and accumulate massive digital records associated with their personal experiences—a valuable resource for connecting with others and for reflecting on one’s own life. However, the size and scale of these massive archives pose new challenges for interactive technology designers and researchers. As digital archives grow larger in the Cloud, they become invisible and fragmented, lacking the material presence that might enable people to engage with their digital archive in everyday life. These effects critically threaten the long-term potential value of personal digital content and new strategies are needed to overcome them. The Olly project takes up these issues in the context of digital music consumption, which is exhibiting a worldwide shift—from locally stored music files toward digital streaming services. The movement toward online services has generated extensive and accessible digital records of listening histories over many years. This archive of listening history metadata provides rich material for designers to work with in creating novel ways for experiencing and living with one’s music collection over time. This project builds on recent research in slow technology (Odom 2015; Odom and Wakkary 2015; Odom, Sellen, Banks, et al. 2014) that provided initial evidence showing that slowing down interactions with large personal digital archives can provide sustained experiences of anticipation, enjoyment, and recollecting the past. However, limited design examples exist of this strategy being manifested through tangible interaction systems and none have investigated music consumption to date. The Olly initial design concept was developed by Jeroen Hol, Bram Nas, and Pepijn Verburg in an graduate module studio called ‘unaware objects’ that I co-taught with Ron Wakkary. Olly was exhibited along with a few other unaware objects at Dutch Design week. We are all currently working together now to develop Olly into a robust research product to conduct a longer-term field study of people’s experiences with it. Thanks for Woeter van der Wal for shooting photos of Olly for us. 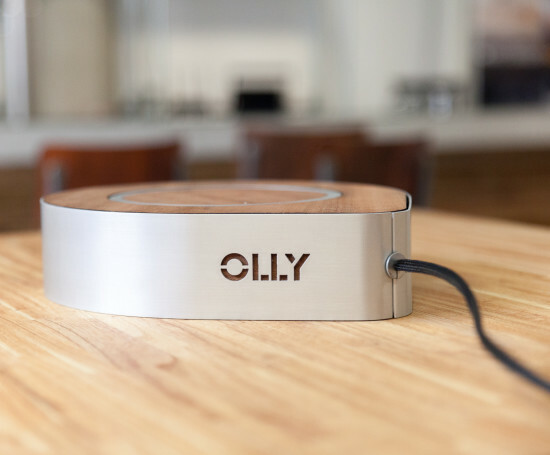 Olly is a slow tangible interaction music player that is linked with its owner’s Spotify music streaming account that occasionally surfaces songs (e.g., several times per week) from different periods in one’s past. When a song is surfaced from the past, a circular wooden disc begins slowly rotating. The rate of the rotation is based on how deep into the past a song is surfaced from; the deeper into the past, the slower the rate of movement. The disc will make twenty total rotations before abandoning the song and eventually moving onto the next selection. To play the song, the owner must speed up the movement of the disc by tangibly spinning it. The form of Olly enables it to operate and be played in any physical orientation. This design choice is motivated by a desire to support long-term interactions with Olly as it finds its place with people’s home and is re-configured to new places, people, and objects over time.